The Wimberley Lions Club meets every first and third Tuesday of most months at 6:00 PM at the Wimberley Community Center on RR 12. Visiting Lions are always welcome. Our motto is We Serve. Nearly 1.35 million Lions members in 194 countries and geographic areas answer the needs that challenge the communities of the world. Wimberley Lions serve the community through support of many charities and organizations. 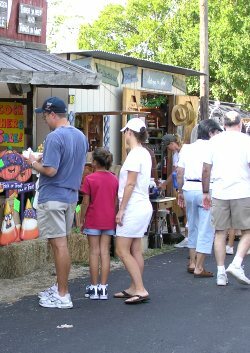 Wimberley Market Days, held the first Saturday of each month from April through December, is the primary fundraiser for the Wimberley Lions Club. The Wimberley Lions Club, as a part of Lions Clubs International, collects eyeglasses for recycling and distribution in developing countries. Lions Clubs International also treats millions of people to prevent river blindness.